Whenever you see this warning, Google Chrome has detected that the site you're trying to visit may contain malware. Malware is code that attempts to steal your personal information or download harmful software onto your computer. "This is probably not the site you are looking for!" This message comes up when the URL listed in the site's certificate doesn't match the site's actual URL, which means that the site you're trying to visit may be pretending to be another site. "The site's security certificate is not trusted!" Since anyone can create a certificate, Google Chrome checks to see whether a site's certificate came from a trusted organization. This message means that the certificate wasn't issued by a recognized third-party organization. "The site's security certificate has expired!" or "The server's security certificate is not yet valid!" If you see one of these messages, that means the site's certificate is not up-to-date. Therefore, Google Chrome can't verify that the site is secure. "The server's security certificate is revoked!" The third-party organization that issued the site's certificate has marked the certificate as invalid. Again, Google Chrome can't verify that the site is secure. Google Chrome goes to great lengths to help keep you safe on the web. If you want to learn more about protecting your computer, website, and personal information, check out our security series on the Google blog or visit http://www.staysafeonline.org. It's National Cyber Security Awareness Month, the perfect time to shed some light on a few Google Chrome alerts that are designed to help protect your browsing experience on the web. a month ago as a new way of contributing helpful information to any webpage. Google Sidewiki appears as a browser sidebar, where you can read and write entries along the side of the page. A lot of great Sidewiki entries have since been written throughout the web -- a few of my favorite examples include a doctor's entry about flu vaccinations and these tips for tuning bass guitars. 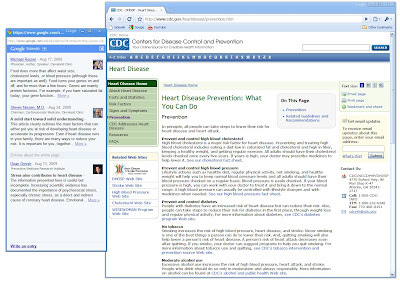 Until now, Sidewiki was available only through Google Toolbar for Firefox and Internet Explorer. Today, we're excited to release the official bookmarklet for Sidewiki, which lets you easily read and write Sidewiki entries in Google Chrome, Safari and others browsers. The bookmarklet is a shortcut you can add to your bookmarks bar: When you click on the shortcut, it opens a window showing Sidewiki entries for the page you're currently viewing. To add the Sidewiki bookmarklet, all you need to do is click and drag the bookmarklet embedded in the Google Sidewiki Help Center page to your bookmarks bar. So what's the next step? We're working on a Google Chrome extension for Sidewiki. For more updates on Sidewiki, follow us on Twitter and stay tuned. 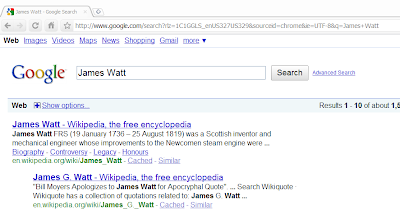 Google Sidewiki was introduced a month ago as a new way of contributing helpful information to any webpage. Google Sidewiki appears as a browser sidebar, where you can read and write entries along the side of the page. A lot of great Sidewiki entries have since been written throughout the web -- a few of my favorite examples include a doctor's entry about flu vaccinations and these tips for tuning bass guitars. in the New York Times about shokunin kishitsu, or the 'craftsman's spirit.' The craftsman's spirit in Japanese culture basically appeals to all of us, regardless of vocation, to aspire to beauty in everything we do and create. As we collaborated with artists around the globe to create themes for Google Chrome, we hope that bringing art from different cultures into the modern browser expresses some of that spirit. We've enjoyed hearing your thoughts on these designs and how you've used them to personalize your browser. For a friend who emailed me recently, the Hedgehog in the Fog theme brought back fond memories of his Russian childhood and the intrepid Yozhik (as the hedgehog is affectionately known in Russia). This Google Chrome theme is based on the 1975 animated film, which incidentally won "No.1 Animated film of all time" at the 2003 Laputa Animation Festival. Beauty can be based on a heart-warming 34-year-old animation that makes us nostalgic, or cultural references that makes us who we are today. Our friends working on Google Chrome in Tokyo pointed us to a few Google Chrome themes that resonate with our users in Japan. These themes are based on a modern-day, participatory culture of remixing ideas. Take for example, the Google Chrome theme from global virtual pop star Hatsune Miku. Hatsune Miku began as a character in a vocal synthesis software package from Sapporo-based Crypton Future Media. But as musicians and artists created a body of work, including songs, drawings and animation for Hatsune Miku, she became a best-selling recording artist in Japan! For the craftsmen -- the engineers -- working on Google Chrome around the globe, shokunin kishitsu provides lots of food for thought, as we continue to build on a browser designed to be fast, simple, and beautiful for users. In the spirit of what our Japanese colleagues call "速い + ART" (or, speed + art), we'd like to leave you with a new video (with a surprise ending). 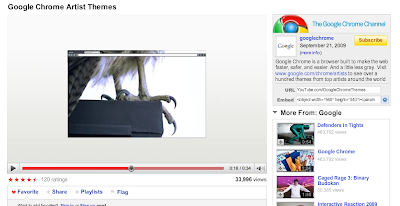 Check it out at youtube.com/googlechromethemes, or by clicking on the image below. Earlier this week, I read an interesting article in the New York Times about shokunin kishitsu, or the 'craftsman's spirit.' The craftsman's spirit in Japanese culture basically appeals to all of us, regardless of vocation, to aspire to beauty in everything we do and create. stable release of Google Chrome, we looked at ways to make a snappy, simple browser even more customizable, and we're happy to hear that you've enjoyed personalizing Google Chrome's look and feel with a few of our early themes for the browser. Today, we are introducing Artist Themes for Google Chrome. We invited leading artists, architects, musicians, illustrators, filmmakers and fashion and interior designers from across the globe to create artwork for an unusual canvas: the modern web browser. The result is a vibrant fusion of art and technology, with a hundred Artist Themes that we hope will add a touch of inspiration and delight to your web browsing experience with Google Chrome. I was really curious to see how the traditional paper craft, which I use for creating my work, can be applied to the Google Chrome browser. 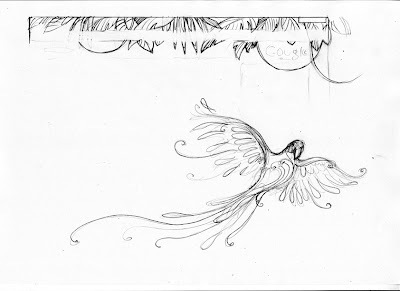 I made a quick pencil sketch first, choosing the two main elements for my theme: green jungle leaves for the top and a very colourful parrot to accompany it. Then I followed my usual working pattern and created a physical artwork out of edge glued paper stripes. 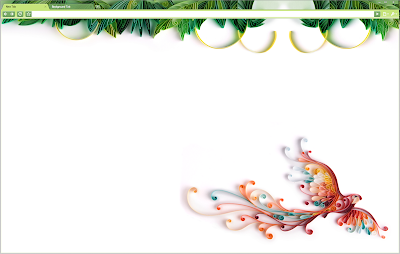 I used the photographs of the paper leaves and parrot to design my theme layout, and sent the resulting mock-up to Google designers who brought the whole thing to life. We're honored to have the opportunity to work with a hundred artists around the world, including Jeff Koons, Jenny Holzer, Karim Rashid, Jonathan Adler, Oscar de la Renta, Anita Kunz, Tom Sachs, Kate Spade, Donna Karan, Kid Robot, Dolce & Gabbana, Michael Graves, Todd Oldham, Yann Arthus-Bertrand, Mariah Carey, and Wes Craven (and that's just to name a few!). Many, many thanks to all the artists for lending their vision, imagination, and hard work to this collaboration. If you haven't tried Google Chrome recently, download the latest version and give the Artist Themes a whirl. If you're already using Google Chrome, you can check out the themes gallery and try on your favorite Artist Themes. In the most recent stable release of Google Chrome, we looked at ways to make a snappy, simple browser even more customizable, and we're happy to hear that you've enjoyed personalizing Google Chrome's look and feel with a few of our early themes for the browser. Rather than needing to copy and paste links, you can also just drag links from other programs, such as word processors or other browsers, and drop them on the Chrome tabstrip in the same way. We've already seen how to open links in new tabs or windows using keyboard modifiers. But what if you want to open a link in some existing place? Click and hold on the link, and then drag it onto or between any of the tabs in the tabstrip. You should see a small arrow appear showing where the link will open. When you release the mouse button, the link will load right at that arrow. If you drop it in the empty space after the last tab, you'll open a new tab at the end of the strip.